The US debut of an author and sociology major who minored in philosophy, played pro basketball in Switzerland, and now teaches English and coaches pro basketball in Lausanne. Ferguson is nothing if not a philosopher. His hero Farley lives in Moraga (near San Francisco), teaches philosophy, reads Heidegger on Dasein (being), and has been locked out of his house for the past six months. His often-jealous and richly accusative wife Carole thinks that, after eight years of marriage, her 40-year-old husband should not be out until two in the morning sipping rosÇ with 21-year-old coeds. So Farley has taken Freda, the family dog, and holed himself up in an apartment. He makes use of his visiting rights to take Ricky and Roseanne, his tumultuous kids, along with Carole on a Christmas trip to see her family. The best passages here show Farley teaching and philosophizing to his students—and even to Carole, telling her that the greatest cosmological nuisance is the existence of women, since this doesn’t allow a man enough time alone to philosophize. Carole retaliates by taking Adoula, a visiting African agronomist who learns English from old episodes of Leave It to Beaver, as her live-in lover. 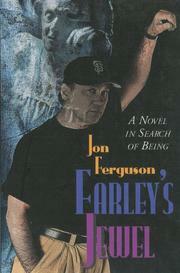 Ferguson’s novel is one of thoughts rather than events—it thinks, chews away on the cud of Being—and Farley’s jewel is his mind: polished and bruised by his life, his dog, his kids, his wife (with her shotgun blasts of jealousy), his dying mother, his ex-student Elizabeth, and his thoughts about self-existence. When Farley’s mother comes down with Alzheimer’s, pity is not part of what he feels, nor when his wife returns to his bed does romance spring into his mind. Still, many will find Ferguson’s debut a pleasurable read despite its slippery grip on the Is-ness of the Novel.